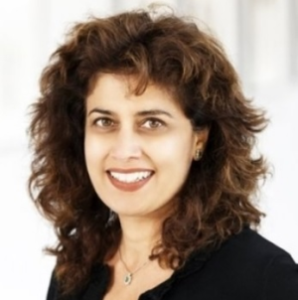 Minnie Sarwal is Professor of Surgery, with joint appointments in Medicine and Pediatrics, Director of Precision Transplant Medicine at the University of California San Francisco (UCSF), and additional positions as Adjunct Professor, Haas School of Business, University of California Berkeley, and Adjunct Professor at the Faculty of Health Sciences, Odense, Sweden. Dr. Sarwal was previously the Medical Director, Pediatric Kidney Transplant Program at Stanford and was on Faculty at Stanford University for 16 yrs. Dr. Sarwal is also a Faculty for the Masters in Translational Medicine Program (Berkeley/UCSF), serves on the Science Board of the FDA. She received her MD jointly from Calcutta Medical College, India and Guy’s Hospital, London, UK, before completing a doctorate in Molecular Genetics at Cambridge University, Cambridge, UK with Nobel Laureate Sydney Brenner. Dr. Sarwal serves on NIH study sections as a regular and an ad hoc reviewer and is a member of several national and international academic societies and has served for many organizations in leadership capacities, such as the American Society of Transplant Physicians, the American Society of Transplant Surgeons, the Transplantation Society, the International Pediatric Transplant Association, the American Society of Nephrology, the Cystinosis Foundation, FOCIS and the National Kidney Foundation. Dr. Sarwal’s clinical interests focus on personalizing transplant immunosuppression, monitoring and management of metabolic renal diseases such as cystinosis and oxalosis, and proteinuric renal diseases such as Diabetic kidney disease, IgA and FSGS. Dr. Sarwal’s research is centered on computational and translational science in renal diseases, on the immunobiology and computationally driven monitoring for organ transplantation and rational immunosuppression trial design; she has presented and chaired at numerous invited scientific seminars and visiting professorship and founded the Transplantomics meeting for the TTS. Her career has been marked by over 200 peer reviewed publications and awards and distinctions. She teaches entrepreneurship classes at UCSF and spun out a diagnostic company from Stanford University, which she led as a CEO to successful exit in 2014, commercializing a blood based diagnostic kSORT for early detection of kidney transplant rejection.